The forecast for today was promising with storms forecast to accompany the passage of the front coming up late afternoon/early evening. 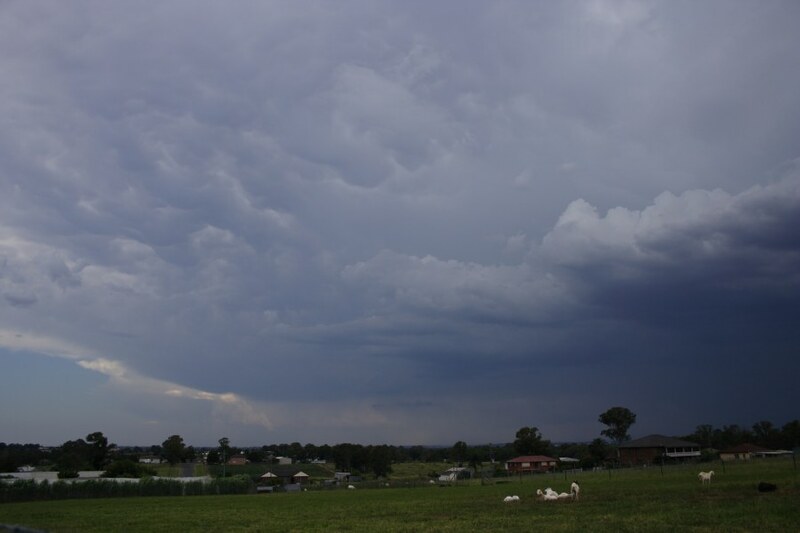 A severe storm warning was issued about an hour ago, and the cell currently over Warragamba and heading this way is looking quite promising. Might go for a walk up the end of the street with a view that way to see what the structure looks like. For people in the METROPOLITAN, ILLAWARRA and parts of the HUNTER, CENTRAL TABLELANDS and SOUTHERN TABLELANDS Forecast Districts. Issued at 1:35 pm Sunday, 13 January 2008. Severe thunderstorms may produce large hailstones, very heavy rainfall, flash flooding and damaging winds in the warning area over the next several hours. Locations which may be affected include Penrith, Parramatta, Wollongong, Bowral, Bathurst and Katoomba. The one currently near Colo was pushing up nicely when I went for a drive to Parramatta an hour or so back. Hmm. 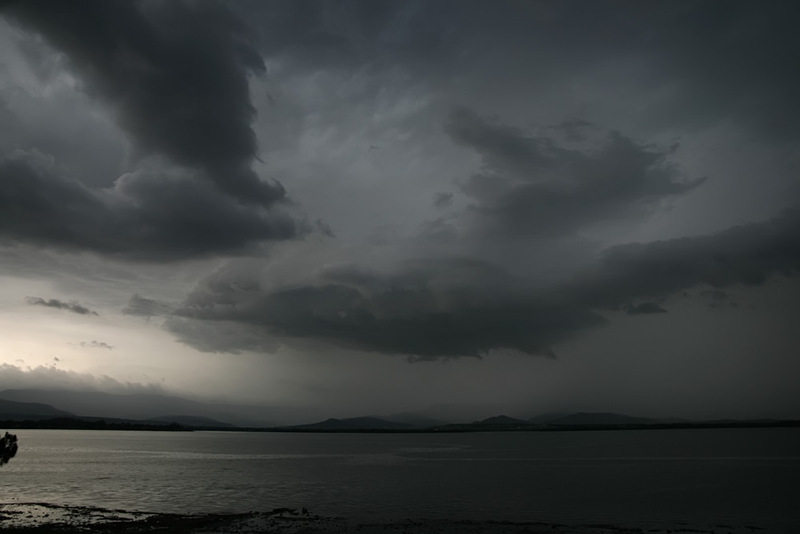 Right moving storm, just gone black north of Penrith. Looks on the verge of becoming a supercell. It had been heading more towards Parramatta then veered north unluckily for my storm watching. Now 3 severe storms in the Sydney warning area. The Penrith one certainly developed a nice black centre for the 3rd last radar image at 0430. Lots of overhead rumblings here but no strikes, radar indicates we should have a bit of rain over us at Rydalmere now or very shortly, just a couple of drops trying to fall at the moment. Have had the radio on and nobody ras rung up to say it is bucketing down which is unusual if there is a big storm somewhere. Did you mean left moving cell? Otherwise I am confused. 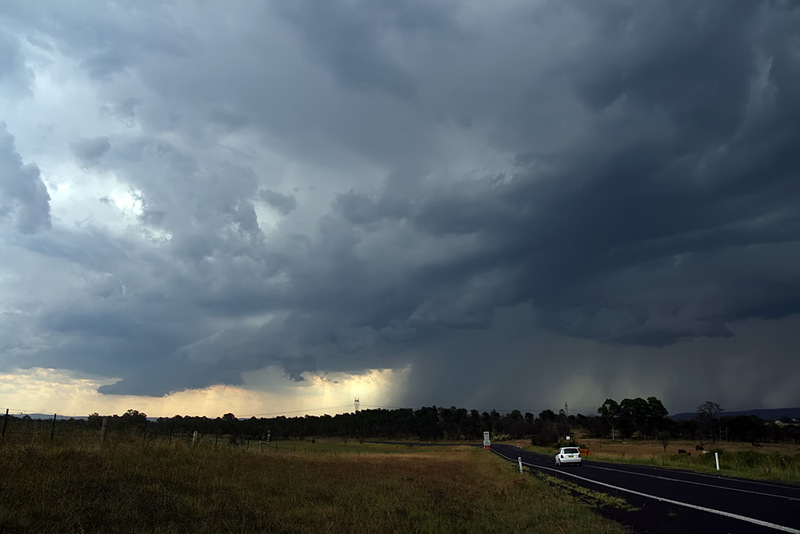 I chased the cell that turned left from near Penrith and it moved over the Landillo area. This is where I intercepted the cell and can confirm hail to at least 3cm in diameter, very heavy rainfall and strong winds. Branches were broken and some trees felled. I even saw one powerline down but it seemed to coincide with the tree being down as well. The maximum on radar seemed to coincide with the region I was in coincidently. It was a bit of a local fun chase and at least the heat is gone! Here at Rydalmere just some light rain so far and lots of rumblings in the sky but nothing to see. Until about 5 minutes ago out of nowhere a huge flash outside somewhere and about half a second later a massive crack of thunder. Rather glad I still have the laptop running on batteries and don't have the big outside radio antenna hooked up if we are going to get those! Yes Jimmy, the storm you were in near Penrith is the one I watched forming over Warragamba way and it initially looked like it was heading towards Parramatta way but then veered north over Penrith, before later heading more NE again towards Hornsby/Berowra way. Not sure why it changed course, probably so I missed the fun. Still lots of little cells seem to be forming so might get something. Just for claridications sake and for your interest, you can get right moving and left moving in the northern and southern hemisphere. In the southern, hemisphere, you would in most cases favour the left mover being stronger and right mover stronger in the northern hemisphere. I guess think of a mirror image. Always think when viewed from behind. some good CC's and CG's. large branches. Plenty of hail to grape (up to 1.8cm observed) size fell throughout this region. (1855EDT) and also the occassional bright flash and sharp thunder crack. I live at Warrimoo and like JD, have been a bit lazy on the chasing front of late. 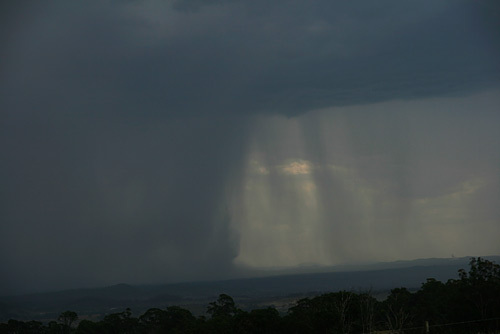 While storms were assured across the eastern ranges yesterday, I decided to watch the event unfold here. The a large rain free base developed right over the lower mountains - and moved down over the plains to dump its load, which correlates to the increase in radar echoes. But their was very little lightning and thunder as Dave noted. This became more frequent as the storm began to precipitate. It was the cells that skipped over later in the day that featured more lightning. We received an impressive 33mm from the event of about 7 separate storms that moved over the area. .
Just for records, sake, the total rainfall here in Schofields was 17.2mm - an unofficial rain gauge at Berkshire Park which was on the edge of the very intense rain received 33mm of rain. Come to think of it, this was one of those storms that track in the Hawkesbury Valley approximately once every year or two. The last time this region copped a violent storm similar to this probably worse was in 1991 when large trees were uprooted and apparently carried. But that is for another thread. One of those chase events that result in very little footage and pictures even though you had a decent time. Headed towards Picton around mid afternoon with the hope of tagging the cell that eventually moved through Penrith. Became a lost cause for me near Wallacia as the cell was moving just too quick for the road network. Headed back south to Appin and observed the cell below forming on the ranges west of The Oaks area. A small microbust appears on the right side of the cell. Although weak at this stage, the cell transformed rapidly as it moved east. Heavy rain and brief hail was experienced near Picton. I followed the cells back to Wollongong were there was torrential rain and a nice CG barrage. 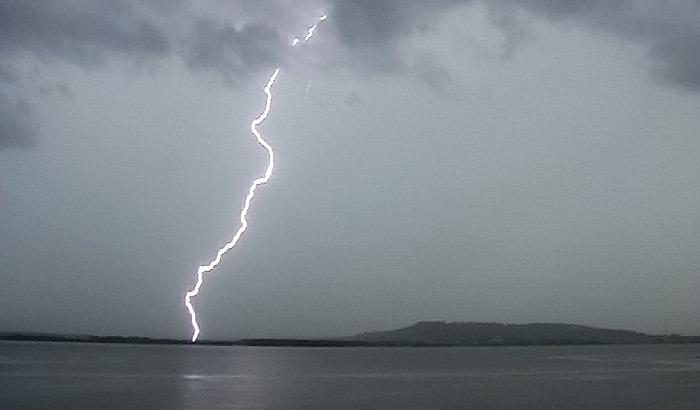 Another weak storm closed the day near Lake Illawarra - the same one that Lightning Chaser captured his nice bolt on. Not so quick on the trigger finger I had to settle for this video still. What I concentrated on was hail footage within this particular storm given the basic lack of base features. Given the temperatures that the hails fell into, I was surprised the hailstones were up to the 3cm mark. Yes I know the temperatures at the surface within the outflow and perhaps within the core cooled off somewhat, 3cm hail was still impressively surprising given the overall atmospheric profile. I guess it was only during that severe pulse. Apparently it seems much damage has occurred in the region affected over Penrith and regions north. Power was out for hours apparently. This is another storm which I watched form from the very beginning. I watched cumulus towers form over the lower Blue Mountains from 1 pm and proceeded to a fantastic lookout at Bella Vista which gives me unimpeded views to the west and Blue Mountains. I took a series of photographs of the development of the storm cell over Penrith and about 3 pm, I decided to do something different. I watched a downburst / microburst on the northern edge of the storm cell / rain shaft and decided that I would try and get inside it to see what was going on. I drove from Bella Vista via Quakers Hill then Scholfields Road, Boundary Road, checking and stopping to make sure I had my target downburst region in view. I drove along the northern edge of the heavy rain area, just skirting it, continued into Riverstone, along Crown Street and found torrential rain (Not allot of wind just torrential rain). I continued driving around the Crown Street area and to my surprise, I found hail. Not sure of the size but I was surprised that I had driven into hail. I would estimate the hail around 1 cm in size judging by the noise. Still driving around the Riverstone / Vineyard area for a while, I finally hit gale force winds around the Junction Street area of Riverstone. I found all three variables, small hail, gales that were stripping trees of bark and leaves and very heavy rain. I reached my target. The amount of leave litter and bark flying across the road was an amazing sight to see. I parked the car where I was away from a tree and watched the storm unfold. There were three lightning bolts one after the other (Not to mention the noise) that hit objects very close to me (I stayed in my car). One knocked out the power in the immediate area. The storm weakened to my north east. Further smaller storms broke out afterwards in the area so I decided to see how many more I could get. 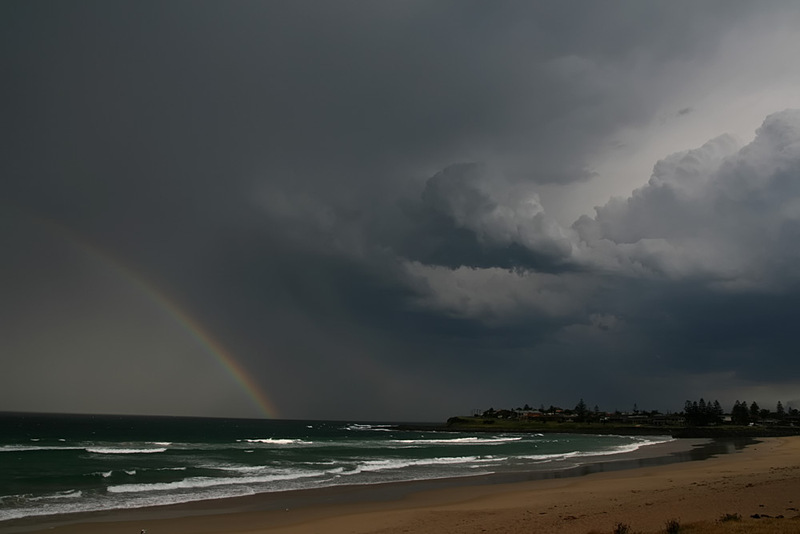 I managed to experience 2 more storms that produced mainly brief moderate showers. I drove back to Boundary Road, then out to Windsor tried to catch a fourth storm but I was too late as it had gone well north into countryside that I could not get to. 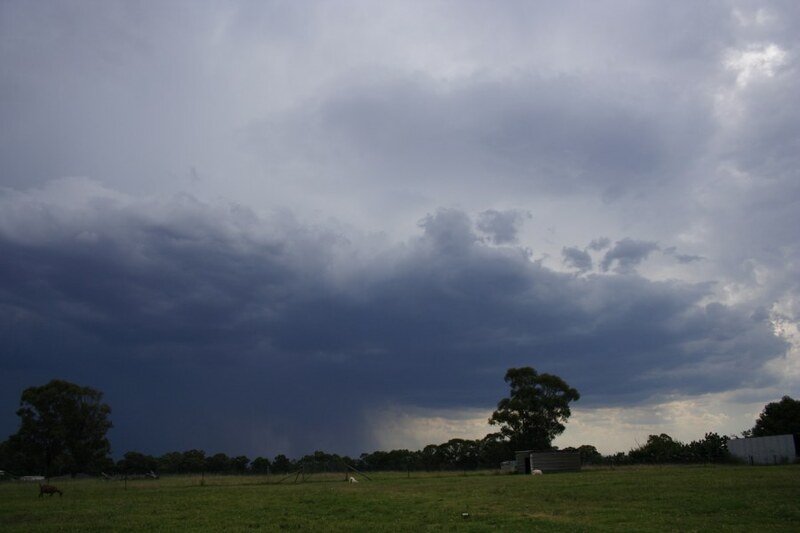 However at Windsor I managed to see out another storm, was soaked by another torrential shower and then drove back to Blacktown in time for another rain storm / thunderstorm cell that ultimately produced a heavy shower. Still, five storm cells in 3 hours is quite reasonable but if I had been paying attention to the cell to the NW around 4.30 - 5 pm a little earlier, then it Could have been even better. While at Windsor, I found another area that had experienced a significant downburst / microbursts because there was a large amount of leave and bark litter lying on the roads.